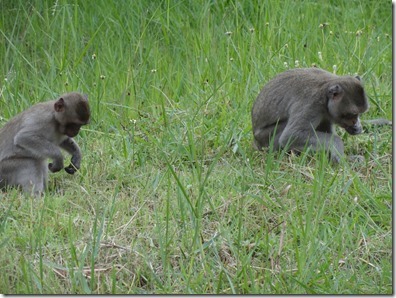 Most of the approximately 1,000 long-tailed macaques that live in Don Chao Poo Forest, Phana, can be found in the forest itself. There are two or three places where visitors often provide them with food. 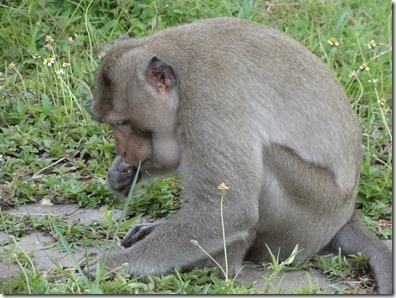 Many of the monkeys wait by the main gate, either just inside the forest or outside, along the road. One the of the surprising things about this provisioning by visitors is that although there is never enough food for all of them, the monkeys always alert others to the availability of food, so that when a visitor with food is spotted, monkeys swarm towards the source. And they do this every time, despite the fact that almost all of them will be disappointed. But as the number of monkeys in the forest has increased, so too have the stories of marauding groups travelling further afield, to nearby villages and to the grounds of the Phana District Hospital. The hospital, it should be noted, was built about 12 years ago on ground that had been part of the forest. 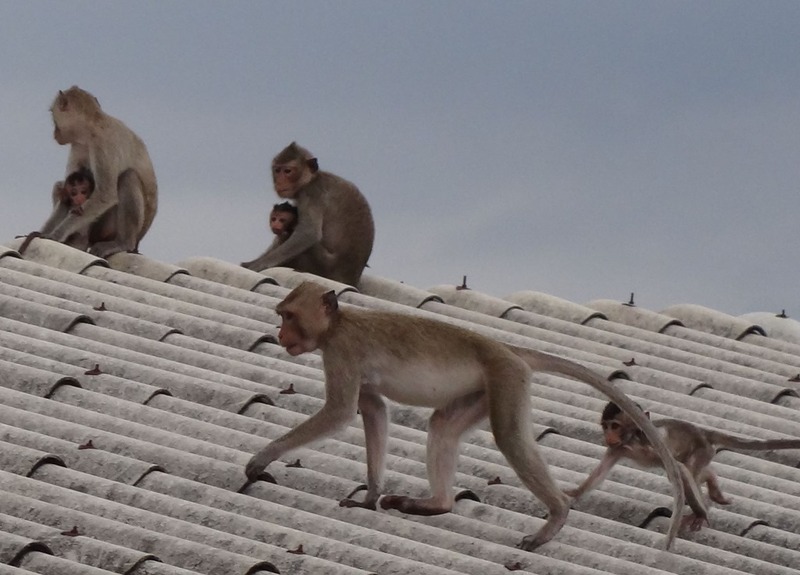 So as far as the monkeys are concerned, the hospital is their territory. 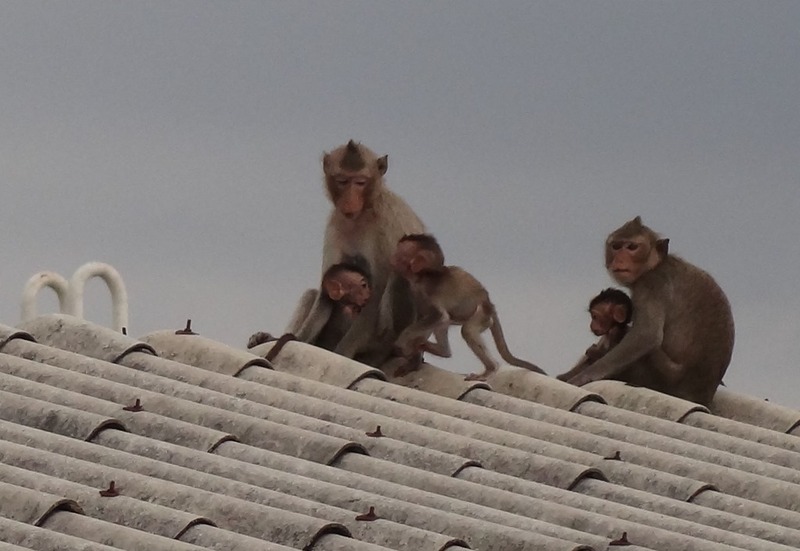 When we started to investigate stories of the monkeys invading the hospital, we found them very exaggerated. On most days we found none, and never more than 3 or 4. But we were visiting during the day. And then one morning we came across a large group moving into the forest from the direction of the hospital. That led to us going to the hospital early in the morning (between 7 am and 8.30 am) and again at about 5.30 pm. The results were quite different. 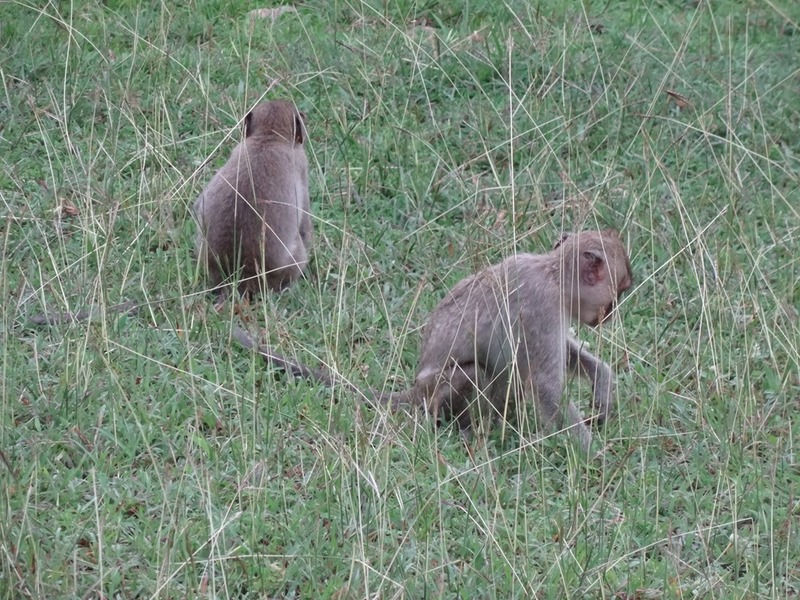 On several occasions we found almost 200 monkeys at both ends of the day! 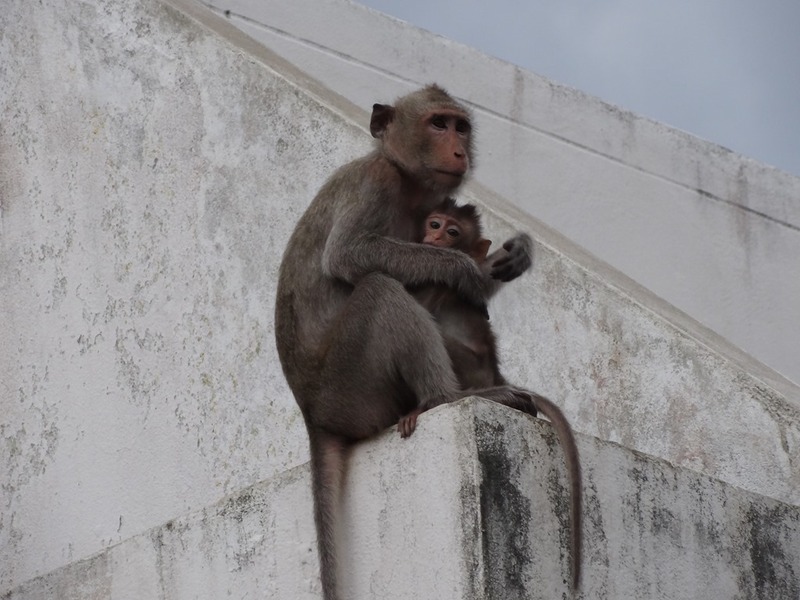 So the monkeys are using the hospital grounds as a roosting place. When we started to watch these monkeys more closely we found that they were also foraging for food, especially early in the morning. On one or two occasions we found that dustbins had been raided but that seemed to be because they had not been emptied as they normally would have been. 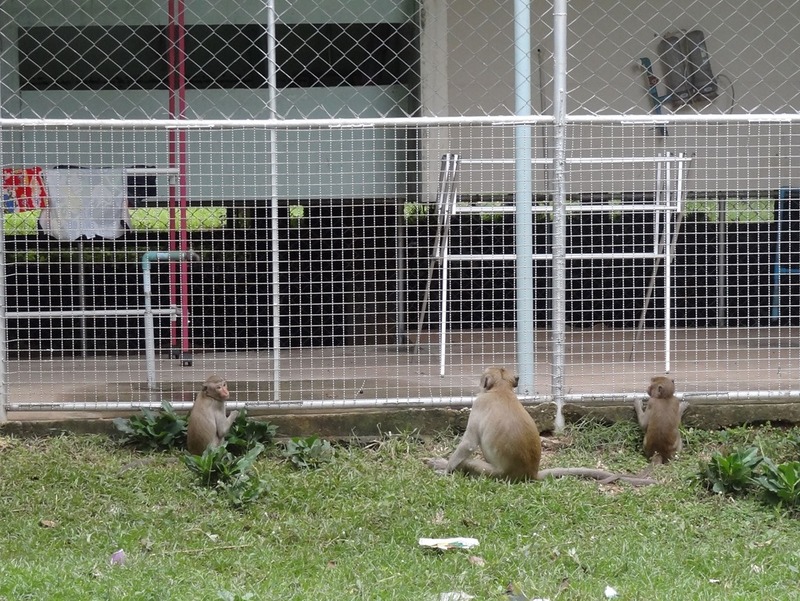 A few monkeys hang around behind the main wards and despite this grill they are often rewarded by people, especially young children, visiting patients. This monkey hadn’t been so lucky and was getting a bit impatient. So the hospital does have three main issues to address regarding these visits by the long-tailed macaques. The main problem, but perhaps not a difficult one to address, is to ensure that dustbins are emptied frequently and regularly. 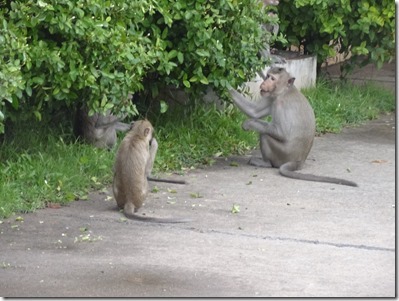 If possible, they should not contain food waste that attract the monkeys. Secondly, visitors to the hospital must be persuaded not to to feed the monkeys. They also need to obtain the co-operation of the noodle vendor who operates in the car parking area, so that he spreads the “no feeding monkeys” message, which will be to the vendor’s benefit as well as to the hospital’s. 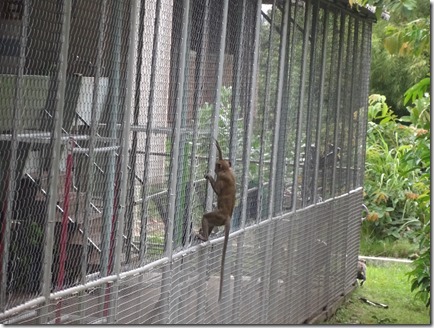 On the part of the Phana Monkey Project, some research was required to get a better idea of the movements and habits of this group of monkeys which use the hospital in the ways I have described, particularly bearing in mind that they do not appear to be present through the main part of the day. We were fortunate in that Felipe do Carmo Jorge, a primatologist from Brazil, was in Phana for a month in July and he tracked this group of monkeys and collected some very valuable data regarding their movements and behaviour. Excerpts from his paper will be posted here soon. This entry was posted in Litterbins, Dustbins, Long-tailed Macaques, Macaques, monkey forest, Monkeys, Phana Monkey Project, Research and tagged Don Chao Poo Forest Phana, Long-tailed Macaques, monkey forest, primate research, Thai monkeys. Bookmark the permalink.